The full transcript of the President Martelly interview is posted below in English... Read it if you don't understand creole. "I think there is a movement trying to crush another movement, therefore they are using some form (yo pase pa yon bagay) but justice cannot be in the hand of people who can say whatever they want. The way justice works is you investigate and you judge based on your findings. Is there an investigation?" Journalist: "Well, that's what we are asking for." Martellly: "Then, let there be an investigation. But when there is no investigation and people are jumping on other people accusing them of wrongdoing. it's like there is another objective." Journlaist: "Up until now the idea of the movement is not to accuse anyone. At the time the money was spent, there were certain people in power. They were managing State funds..."
Martelly: "Cousin, let me tell you something... I was at the head of it (as president) and I know what is happening. You see the people who are creating this movement, they just don't want to get caught. That's it. They know if there is an investigation into PetroCaribe, they will get caught." Journalist: "Would it not be better if there was an investigation istead of people saying I am not involved." Martelly: "Did I ever say I am not involved? Did I ever say I don't want an investigation? This is the first time I am talking about this. I want an investigation but I also know where the investigation is going." Journalist: "Where is the investigation going?" Martelly: "Where people owe the State, Where the money is. It's going where the money is, they just have to run an investigation. We want an investigation. Who doesn't want an investigation? I am here I am trying to face you. You didn't ask me for an interview, I offered you this interview. If I was running you would never see me." Journalist: "Are you ready to go to a street protest to say you want an investigation?" 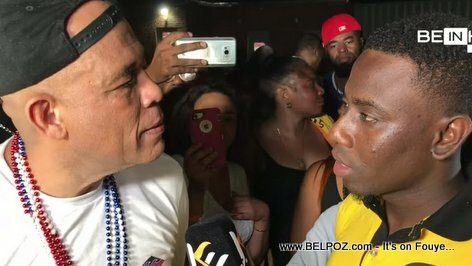 Martelly: "I may decide not to go to a street protest because there are people in these street protests can do whatever." Journalist: "You can write on the Internet. You can make a video." Martelly: "Let me tell you. As soon as I talk some people will think I am trying to defend myself because there are others who have accused me. So I keep my mouth shut. M poze!" Journalist: "Some people accused you? Le President est mineur"
Martelly: "Voila! People who don't even understand. When things are happening, sometimes the president is not even aware. Let me give you an example. Gerard LaTortue was prime minister, you didn't even know who was president. because the president has no power on these things. Therefore, what this means is those who have the tendency to talk about me, they know where they want to go with it. They recognize their weakness in me. They may see me as a force and they want to attack me. All I am saying is as soon as there is a real investigation the people behind this PetroCaribe movement will be implicated. Once an investigation is conducted you will understand."